After Lynda was done with her work on Wednesday, the company paid for them (as well as Matt and I) to take a tour of Jerusalem. We left after a brief time at the Tel Aviv office and took a tour bus w/ guide into the city. Along the way we learned some brief history about Israel. Once in the city, we stopped at an overlook of the many hills that make up The Holy City. Our guide--who's name I never heard--showed us the area of the Old City within the walls, as well as the hills making up the Mount of Olives and another Mount that I can't now recall. After this orientation, we drove down into the city and entered the Old City at the Jaffa Gate. And speaking of walking, there was a lot of it to do in Jerusalem. As I said, the streets of the old city were more like ramps going up and down. There were steps cut into the inclines, with narrow inclines set between steps. I thought that the ramps were placed there for strollers, but when I passed a mother lifting, lifting, lifting her own stroller I found that wasn't the case. Whether it was intentional or not, the moped riders were taking the most advantage of them, quickly maneuvering through the crowds and going up and down. I wonder if the ramps were a new addition to the streets in a renovation some decade past. It is always a valid question when visiting a tourist city, even one as ancient as Jerusalem--and maybe even MORE valid in such a place . . . how real is what you see? Certainly the buildings are real, and that is a spectacular experience to see the inside of the Church of the Holy Sepelchure, when before you've only seen photos. The building has stood since the Middle Ages and millions have passed through it. The mosaic art on the walls and the architectural detailing are worth every moment. To count myself among those to have seen it is so meaningful. But, was Jesus nailed to the cross in that corner of the building, hung to die only five feet to the left of that, then laid in a tomb that is--unexpectedly--another twenty-five feet to the left of that and down some stairs? Really? To say that the Bible never gives the impression of such proximity is, obviously, a useless argument for or against. I've always believed the Bible to be a good approximation of the life of Jesus and a guideline of how to live a Godly life. It can't be taken as a verifiably accurate description of how it really happened. And especially not for the most critical moments that must mean the most. As with other aspects of religion, the believer must act on faith and live in hope. So, is the Church of the Holy Sepulchre a shrine or an amazing museum and recreation? My historical objectivity must claim the latter, and that does not weaken my spiritual experience. Maybe that is why it felt more meaningful to visit the Temple Mount later that day. 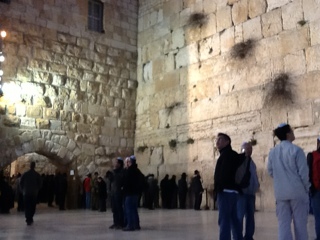 Here was a historical place filled with actuality AND spiritual depth. Here I could take a short prayer, place a tourist yarmulke on my head, approach the Wall, place my prayer, touch the stones, and think about where I was, how I got there, say a prayer of thanks and hope, and look into the twilight with people all around me. Thinking back, this moment, alone in my own personal silence, was the biggest blessing and the greatest gift. (I am choking up and tearing as I try to explain it.) I am so lucky to have the beauty of my life and to have the chance to have that moment is built upon the love, work, and friendship of so many people in my life, past and present. I hope they can be assured that I am grateful to them for the role they play in my life. I choked up, too, Dave and I'm glad to know you had that spiritual moment in the Holy Land. Seriously Mom, I sat on the plane (where I was typing this) and cried for about five minutes. It was really unexpected, but so valuable.